Chimichurri is to Latin-America as what green pesto is to the Mediterranean: An herb-based culinary specialty indispensable to the native cuisine. Chimichurri originated in Argentina and green pesto in Northern Italy, and there are as many adaptations to each recipe as stained glass variations in their cathedrals. Herbaceous and vinegary, chimichurri sounds appealing tonight. Parsley, vinegar and olive oil seem to be the trinity of a classic chimichurri. But after that, all bets are off. The kitchen basil needs pruning and is thickly blanketing tables at the Farmers Market. I have sherry vinegar in my cupboard, which is wonderful in Latin American food, but red wine vinegar is a fine substitute. Chopped shallot or onion could be substituted for, or added to, the garlic in the recipe; the addition of any type of diced hot pepper -perfect! Fresh cilantro is commonly used (in place of the basil) in chimichurris. If I was using cilantro, I would substitute a teaspoon of cumin for the oregano in the recipe as well. This sauce can be made and refrigerated up to 24 hours before serving. The recipe can easily be multiplied, freezing the extra, to utilize the bounty of August herbs. Typically served with grilled or roasted meat, I particularly enjoy the lean cut and economy of flat iron steak. Skirt or flank steak would be fine substitutes. Enjoy any leftover chimichurri with grilled chicken and vegetables. I’ll serve this with crusty bread and roasted potatoes-but any great “mop-up” side dish will do. In a food processor or blender, pulse 3 cloves of garlic. Add olive oil, 3 tablespoons vinegar, 1/4 teaspoon cayenne, parsley, basil and oregano. Pulse until well-blended but not puréed. Season to taste with kosher salt and additional garlic, vinegar and cayenne. 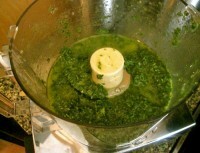 Place half of the chimichurri sauce in a large resealable plastic bag or shallow dish. Reserve remaining sauce. Marinate flat irons in sauce 2-4 hours, refrigerated. Preheat charcoal or gas grill to medium high heat. Brush off excess chimichurri and place on oiled grill grate. Grill 6-9 minutes on each side (internal temperature of 135˚ for medium rare steak). Remove the steaks from the grill. Let sit 5-10 minutes then slice against the grain with a very sharp knife. 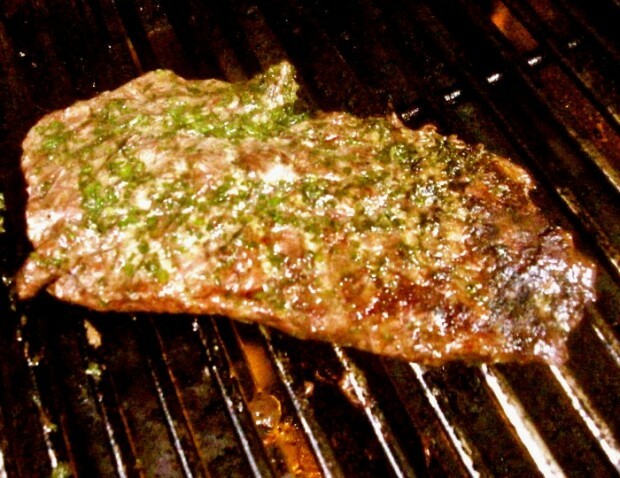 Drizzle reserved chimichurri sauce over sliced steak and serve.